I have a baseboard and a printed 1:1 scale trackplan. 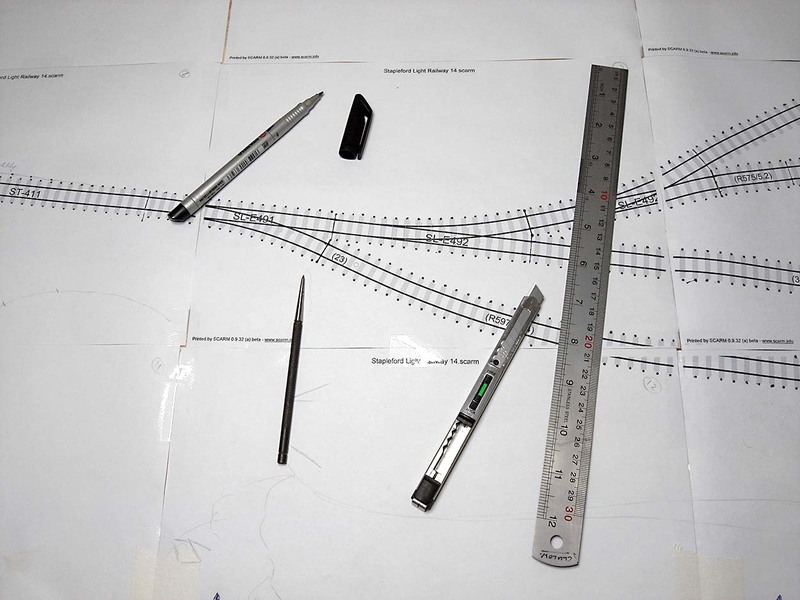 I want to transfer the plan from the printout to the baseboard so that I can lay the track according to the plan. First, I stuck the trackplan in place using masking tape. 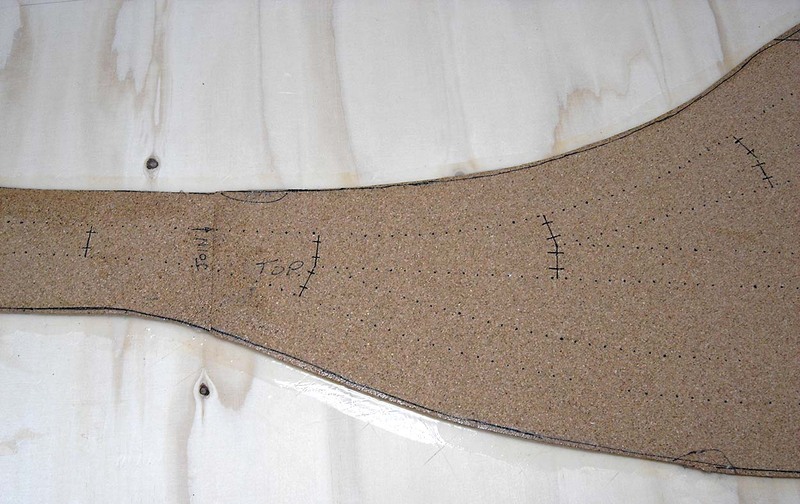 On the plan SCARM adds a straight line at the ends of the points (switches). I cut through the paper along these lines with a craft knife. Additionally, I made cuts along the rails at each end of the point. Then drew the position of the lines with a marker pen, drawing through the paper onto the cork. To mark the rest of the track I pushed a scriber through the paper at the ends of each sleeper, then pushed the marker pen through each hole to create a dot on the baseboard. This gave me the position for each point, and dotted lines marking the position of the rest of the track. It sounds quite a bit of work but you soon get a rhythm going and it really doesn’t take that long to do. I spent quite some time designing the track plan on the computer. 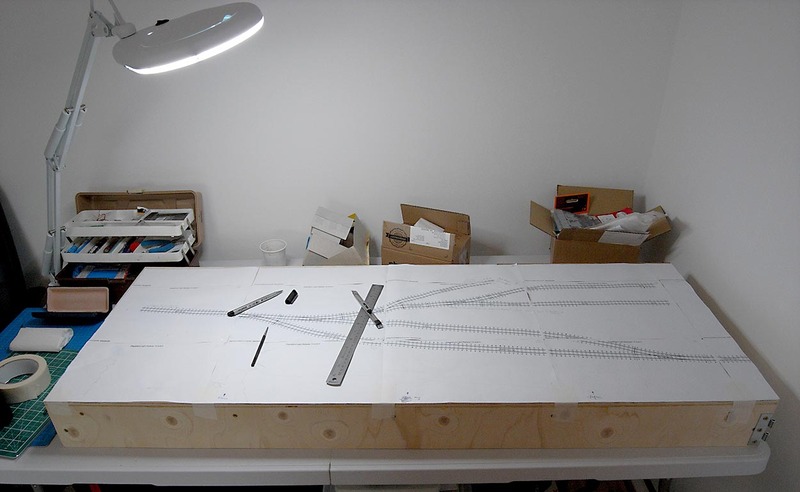 I’m pleased to say it was really simple to transfer an exact copy of the plan on the baseboard and I know exactly where to put each piece of track. PERHAPS I’LL HAVE TO DO THIS SOON, MYSELF! YOU DID A REALLY GOOD JOB OF IT!